Airborne Oil & Gas B.V. announced it has been awarded a contract from Total to supply a thermoplastic composite pipe (TCP) jumper for a deepwater project in West Africa. The field is located approximately 150 km offshore in water depths of up to 1600 m. This contract follows the successful completion of a rigorous testing programme, in which Total qualified Airborne Oil & Gas’ TCP water injection jumper for permanent subsea applications. Under this contract, Airborne Oil & Gas will provide Total with a 5.2 in. ID, 370 bar design pressure TCP jumper for water injection. 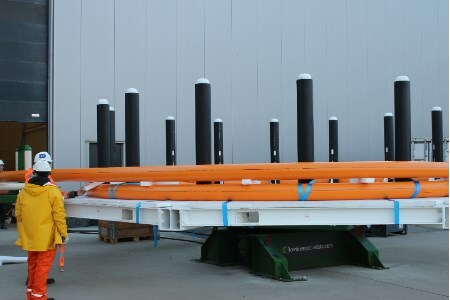 The TCP jumper is intended to be terminated in country and installed using a subsea pallet, deployed from a small vessel. The TCP jumper is non-corrosive, lightweight, flexible, spoolable with a small minimum bend radius and can be terminated at any location along the pipe. This provides the end user with project value in lower total installed cost through cost effective transportation, and removing the need for metrology, while de-risking the project schedule. The TCP jumper can be manufactured and shipped in long continuous lengths, stored onsite and when required for the project, cut to length and terminated within hours, ready to be deployed.